After my heavy brain detour in non-fiction, I needed a quick jump back into my wheelhouse of fantasy. As I eagerly await the next novel in the Great North Woods Pack series, I understand that authors sometimes need a break from their worlds to get a fresh perspective and knock off the spiderwebs. 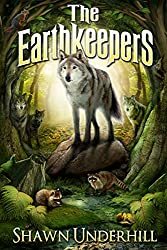 Shawn Underhill has done just that with a detour into a new series starting with The Earthkeepers, which is a series shelved in the children's section for a middle age audience. While it is targeted at a younger reading level than usual for me, I found the book to be extremely well written and intellectual. The author makes some very important points on the lessons we should be learning even in our adulthood. The plot and dialogue aren't overly complicated and can border on plain to an adult reader, but the transparency for the young reader is excellent. This book has a great cast of characters to keep young readers interested for the future of fantasy. The main protagonist, Ethan, is a shy boy with a serious speech problem. He is a good kid from a good home with few struggles besides constantly being misunderstood from not speaking. I love that the most. Not every coming of age story has to be filled with darkness and broken homes for the hero/heroine to overcome. It is still hard to grow up in the best of circumstances. Ethan is the kind of character that kids can relate to because he feels awkward while he is trying to do something important--like most kids. The pacing stays nice and steady with plenty of laughter and action throughout to keep a young reader's attention. The brilliant whimsy of the story comes from all the secondary characters being animals like any good fable. I seriously love Clodstomper, the moose. I really felt a different voice in my mind while reading his dialogue. I do not often get that dynamic of a reading experience. Shawn managed to really play up all the different personalities of the forest. Even adults can learn some valuable lessons from their furry, forest friends. The whole story really made for a fun read. We really can't loose our imaginations as adults. This book can help you keep in touch with your childish innocence. I am really glad I gave this young reader a shot. It is easily 5 stars (despite some editing hiccups, which seem inevitable in today's self-publishing market), and Shawn does not charge steep prices for his novels. They are all $2.99 or less and worth every penny. Spread the word and pick up your copy today.